On the west side of St Pancras Street, just a few yards north of the Euston Road, a flight of steps leads up to the forecourt of the old Midland Grand Hotel, the huge, dark gothic fantasy of a building which stands, empty and desolate, across the front of St Pancras railway station. Over the top of the steps, picked out in gold letters on wrought-iron-work, stands the name of the station. Taking his time, Dirk followed the last of the band of old tramps and derelicts up these steps, which emerged just to the side of a small, squat, brick building which was used as a car park. To the right, the great dark hulk of the old hotel spread off into the night, its roofline a vast assortment of wild turrets, gnarled spires and pinnacles which seemed to prod at and goad the night sky. High in the dim darkness, silent stone figures stood guard behind long shields, grouped around pilasters behind wrought-iron railings. 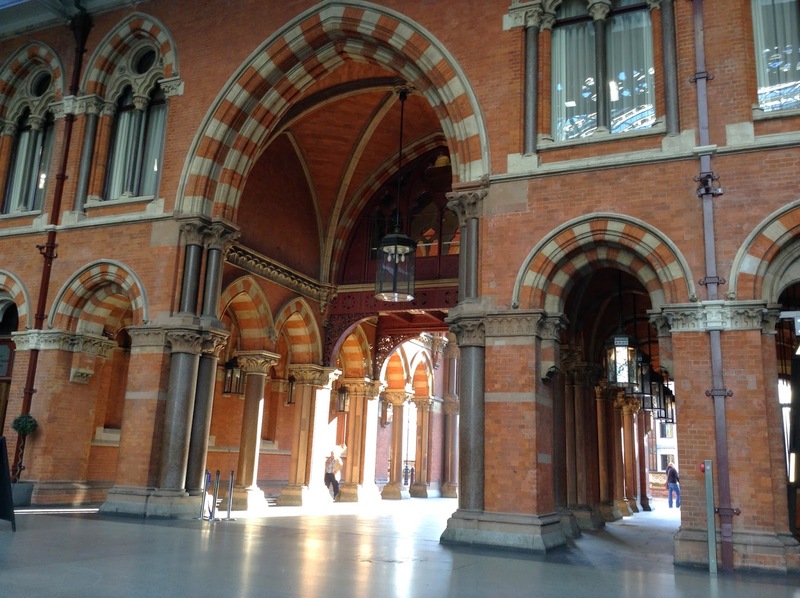 Carved dragons crouched gaping at the sky as Dirk Gently, in his flapping leather coat, approached the great iron portals which led to the hotel, and to the great vaulted train shed of St Pancras station. Stone figures of winged dogs crouched down from the top of the pillars. Here, in the bridged area between the hotel entrance and the station booking hall, was a large unmarked grey Mercedes van. A quick glance at the front of it was enough to tell Dirk that it was the same one which had nearly forced him off the road several hours earlier in the Cotswolds. Dirk walked into the booking hall, a large space with great panelled walls long which were spaced fat marble columns in the form of torch holders. At this time of night, the ticket office was closed - trains do not run all night from St Pancras - and beyond it the vast chamber of the station itself, the great Victorian train shed, was shrouded in darkness and shadow. Dirk stood quietly secluded in the entrance to the booking hall and watched as the old tramps and bag ladies, who had entered the station by the main entrance from the forecourt mingled together in the dimness. There were now many more than two dozen of them, perhaps as many as a hundred, and there seemed to be about them and air of repressed excitement and tension. And one by one they disappear, until finally Dirk Gently is left all alone in the middle of the great, dark, empty railway station. A gust of wind blew through the huge vaults of the empty station and nearly provoked in Dirk a great howl of frustration at the trail that had so suddenly gone cold on him. The cold moonlight draped itself through the long ranges of glass panels that extended the length of St Pancras station roof. It fell on empty rails, and illuminaed them. It fell on the train departures board, it fell on the sign which explained that today was a Blue Saver Day and illuminated them both. Framed in the archway formed by the far end of the vaulted roof were the fantastical forms of five great gasometers, the supporting superstructures of which seemed in their adumbrations to be tangled impossibly with each other, like the hoops of an illusionists conjuring trick. The moonlight illuminated these as well, but Dirk it did not illuminate. 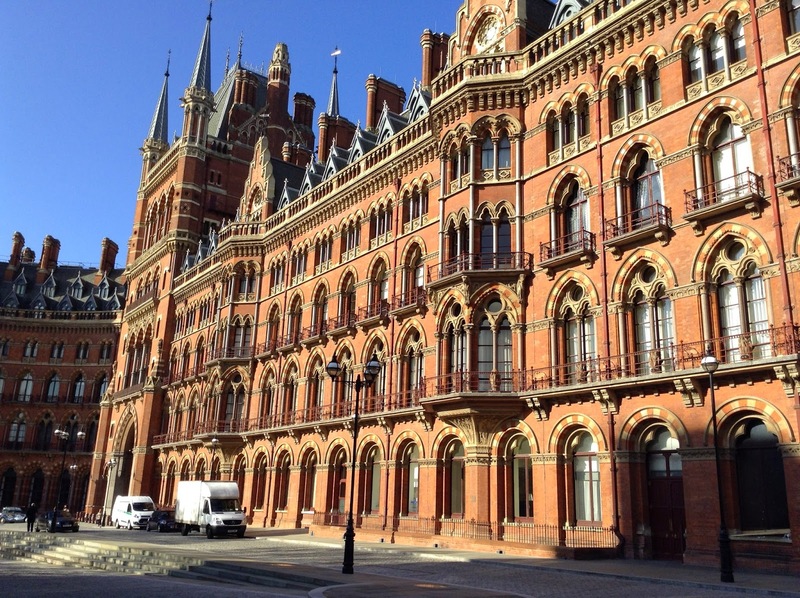 It's still sort of like that except that in the sunlight it's all glowing amber brick and sparkling crystal roof, beautifully renovated and serenely focused rather than hectic (for a station before lunchtime, and one that is now host to the fastest train out of Britain). The booking hall has become a bar of the same name, there is a chic shopping arcade in the lower concourse and a couple of nice sculptures. I would love to stay in what's now known as the Renaissance Hotel, just so I can see what it's like inside. Which is kind of a crazy thing to want to do when you live in London already.